It turns out that it pays to have a duck blind in your backyard. We've worked out a system of going out the front door, sneaking down the fence line, hiding behind the shed, and then sitting on a bench behind the camouflage blanket that is draped over a fence at the water's edge. 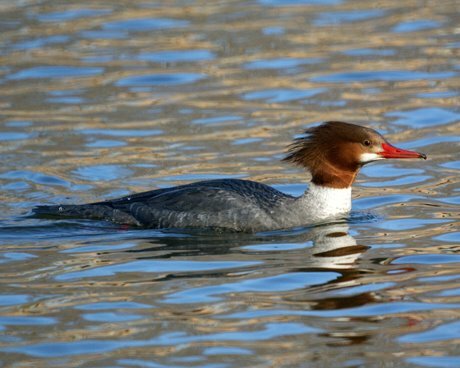 It's a good spot just to watch the antics of the mergansers without scaring them off. Today, after waiting a while, some common mergansers swam by. The top two are a female and the bottom a male. These pictures are definitely worth clicking on to get a detailed image. 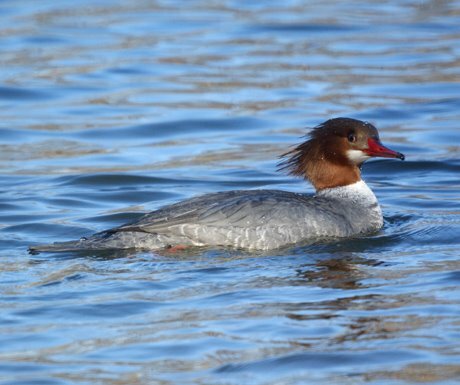 There are some hooded mergansers in the area, so we might not go out for groceries today. Great pics & howdy neighbor! I actually live off Metlars lane in P-way. Found your site when trying to find out what type of hawk has been hanging around my yard. Great photos! Small world too! The feeder is quite popular these days. Pine Siskins and Goldfinches are sharing the feeder in the top photo. Two house finches are shown in the bottom photo. The Hooded Mergansers are back. We want spring to come as much as these birds do. Flicker Babies: We couldn't wait. For those of you visiting this site who do not know us, we thought we would offer a brief explanation of how it all happened. We have lived in several different states, including Connecticut, New Hampshire, California, Virginia, and New Jersey. The house we rented sits right on a small lake, so we initially saw lots of geese and some mallards, rather mundane yet enjoyable. There seemed to also be an abundance of woodpeckers, and we started putting suet out for them. Mike frequently gets up early, and while working from his desk in the window this past fall, he noticed something other than geese on the lake. At first it started with a Pied-billed grebe, and then we also saw briefly a Wood Duck or two, a few Ring-necked ducks, Bufflhead, and then the gorgeous Hooded Mergansers. Well, we’ve fed birds before at other homes, but we’ve never lived on water, and we were especially fascinated by the beauty of the Hooded Mergansers. 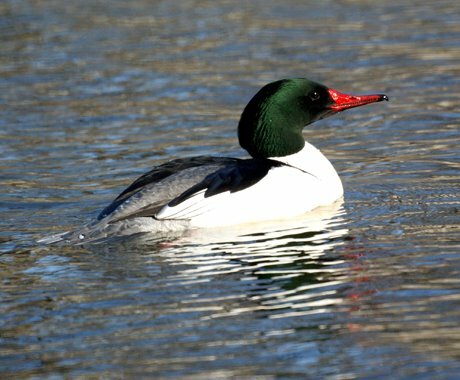 We have two grown daughters and family sprinkled around the US, and we were constantly e-mailing them pictures of the birds and ducks, so we decided it would just be easier to put them up on the web to share. We are not real die-hard birders, and we have no formal photography training. We’re just a couple who is enjoying the birds and waterfowl of their own backyard and wanted to share them. So, you may find more professional pictures somewhere else, but we hope you enjoy our site as well. We moved back to California in June 2012, and we've started a new blog, California Birds. Here are our most recent California photos.